Is your Content Strategy optimized for performance? Checkout this guest blog by Rohan Ayyar from SEMRush! What is the missing link in your content strategy? Creating content is easy. Write a blog. Whip up a neat chart or graph. Share your thoughts on video. It’s managing this content and deploying it using a coherent content strategy that is tricky. 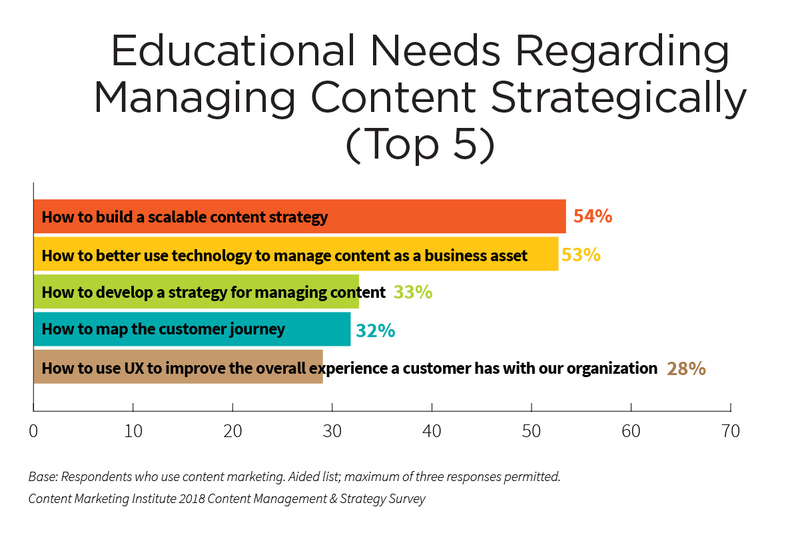 According to a recent CMI survey, Over half of all marketers agree that building a scalable content strategy is one of the skills they still need to develop. Focusing on your content strategy and by extension, content marketing is a smart way to get more out of less. With all the buzz around paid marketing or outbound marketing as we like to call it, we sometimes tend to forget that good old content marketing can beat outbound marketing hollow on any given day. 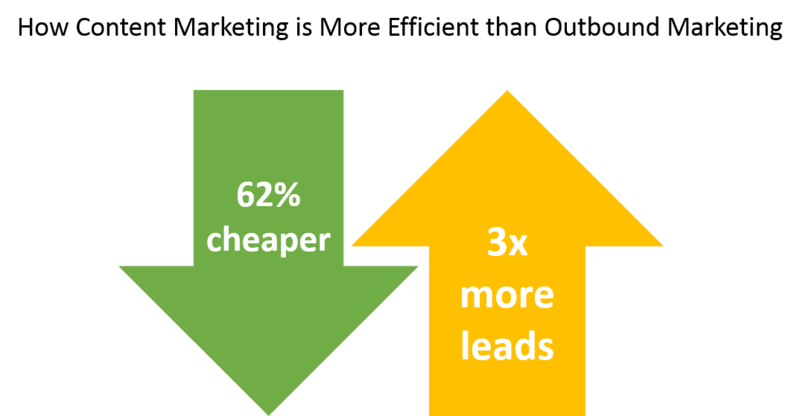 So, how do you leverage this lead generation machine and make it even more efficient for your startup? By fixing these gaping holes in your content strategy. 4 What Are You Missing? You’ve no doubt worked hard on your website’s SEO. From optimizing on-page elements to getting all your ducks in a row for local search, you’re all set to get top rank on Google. Or are you? As a startup, you might not have much local presence at the outset, but it’s essential that you start connecting with local communities via content as soon as you spread your tentacles in each city. Local search is not just about ensuring your NAP details are correct all over the internet or setting up a Google My Business page for your nascent startup. Think about local search just the way you’d think about regular search. Ranking high for a generic, non-local keyword or keyword phrase would mean creating relevant content and optimizing for the respective keywords. Then why would you not do the same for Local SEO? Locally relevant keywords in the schema or metadata of existing content pages to make them do double duty. Much as we’d like users to directly search for our brand name or at least the name of the product we make, more often than not, users go with finding an answer to a problem instead. So, the chances of a user clicking on your listing on a SERP for “organic calcium-rich dry dog kibble” are far higher than someone coming to your site with a simple search like “dog food”. Welcome to the long tail of search marketing. 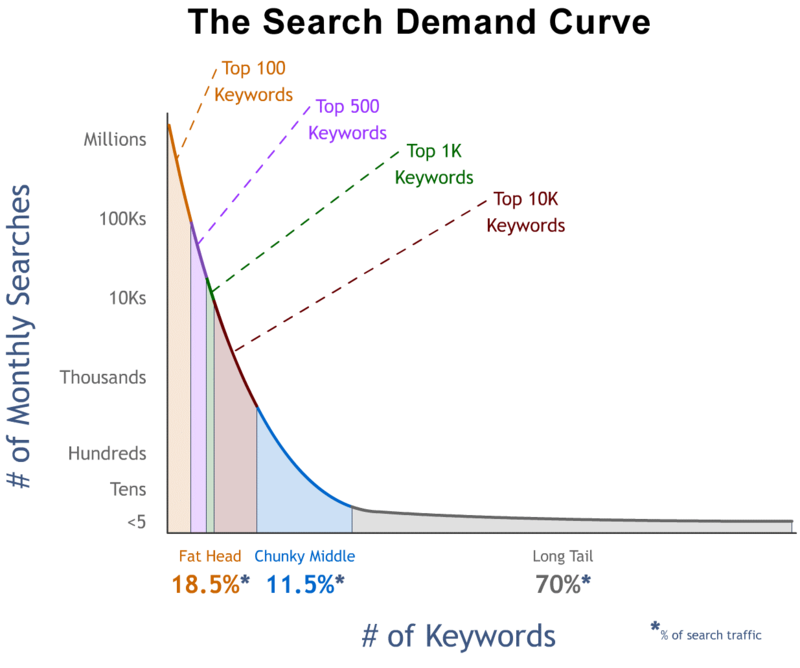 Why should you care about long tail keywords? Here’s why. Firstly, top keywords (like “dog food” in this case) see fierce competition and typically, big brands with deep pockets get top billing on SERPs. This means, the chances of a startup like you ranking for these are low in the first place. Secondly, data shows us that long tail keywords account for 70% of the search traffic around the world. While the total number of searches for a top keyword may be in the millions (see graph above), there are thousands of keywords and keyword phrases that users search for that together outnumber the searches for just the top keywords. 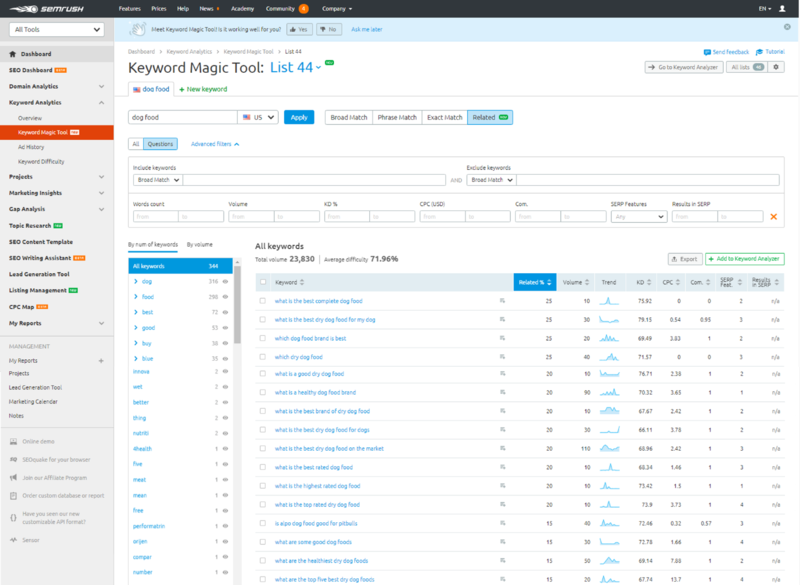 The SEMRush Keyword Magic Tool is my go-to resource for discovering the best long tail keywords to focus on. The example above shows keywords related to “dog food”. To match the natural language queries that a typical user would search for, I decided to use the “questions” option in the tool. As you can see, the tool not only gives me over 23,000 related keyword phrases in question form, it also gives the search volume (number of monthly searches for the term), keyword difficulty (how hard it is to rank for that keyword), and more for each suggestion. Any under-staffed and overworked marketing team at a startup can gather ample ideas for long tail content with that level of detail! 2019 will be the year of voice search. In 2016, Google disclosed that 20% of all mobile queries it gets are voice based. With the proliferation of smart speakers in the last couple of years, that share is set to jump to 50% by next year. You heard that right. 50% of all mobile queries will likely be voice-based by next year, 2020! If optimizing for at least 50% of your traffic is not on your content strategy yet, you better make some room for it right away. Optimizing for voice search is not rocket science, so startups don’t have to do anything extra special about it. However, it does require you to go back to your basics. Get into the structured data on your pages and complete your schema as accurately as possible. Schema categories like Local Business, Postal Address, Ratings, Events and Recipes can be leveraged to provide users with direct answers for potential questions they may have related to your business. These, in turn, frequently get converted to featured snippets or voice answers. Typical voice searches use natural language patterns instead of formal keywords or keyword phrases. Keep this critical aspect in mind when creating content and optimizing your on-page elements. Remember to include semantically relevant keywords to help your content surface higher on related voice searches. Mobile optimize your website and your content, as most voice searches happen on mobile devices instead of desktops (duh!). This means improving your page load times, making your page design mobile friendly, keeping navigation simple, offering “click to call” buttons, and so on. It can be tough to cover all bases with your content marketing. However, with the amount of competition out there (Hey, how many startups are trying exactly the same thing as you are?) it’s important to prioritize which elements of content marketing will define your USP and growth strategy for the year, and which ones will be done on a “best effort” basis. So what’s going on your must-do list? Let’s discuss in the comments! Rohan Ayyar is Regional Marketing Manager at SEMrush, overseeing their branding strategy for India. He is an experienced digital marketer who has worked both agency and in-house, developing data-driven strategies for SEO, PPC, social media and content marketing. Rohan is also an avid business and tech blogger – his insights are frequently published on publications like Entrepreneur, Fast Company, Search Engine Journal and Social Media Today. "The 3 Missing Links in Your Startup’s Content Strategy", 5 out of 5 based on 1 ratings.